Nachi Falls (那智大滝, nachi no ootaki) is one of the three major watrfalls as well as Kegon and Fukuroda in Japan. Nachi is located in southern Wakayama prefecture. It is also chosen as 100 best Japanese waterfalls. The height of the falls is 133m and the width is 13m. As a single straight falls, Nachi Falls is the highest waterfalls in Japan. It has been respected as the sacred waterfalls by many people. Today, it is registered as UNESCO World Heritage Site. There is a parking around the bottom of the falls. 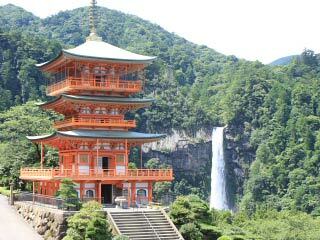 Seigantoji temple has a great view of this falls. 2. use bus to Nachisankan kanko center. There are 48 Nachi falls in Mt. Nachi. The fist falls is what every one considered as Nachi Falls. It is 133m talls and 13m wide. As a single straight falls, it is the tallest waterfalls, and even in total, it is top 12 waterfalls in Japan. There is a shrine on the bottom of the falls.